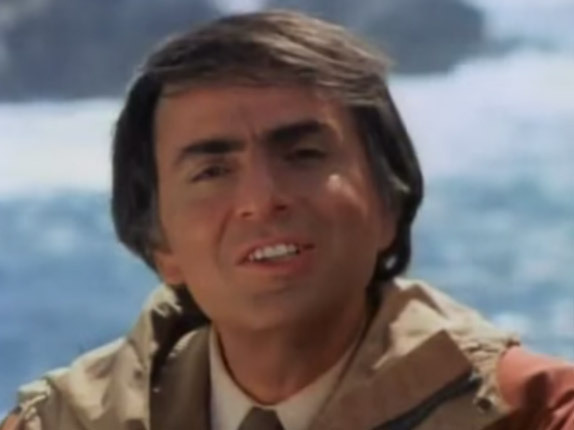 Carl Sagan was an American astronomer and planetary scientist. He served as Professor of Astronomy and Space Sciences and Director of the Laboratory for Planetary Studies at Cornell University until the time of his death from a rare bone marrow disease. Widely known for his popularization of science, in books and on television (notably his Cosmos series, which first aired on PBS in 1980), he made many important contributions to planetary exploration, astrobiology, and SETI. He coauthored with Iosif Shklovskii the influential Intelligent Life in the Universe (1966), participated in sending the Arecibo Message, and helped design the Pioneer plaque and the Voyager interstellar record. In the field of planetary science, he established the greenhouse model for the Venusian atmosphere and helped show that seasonal changes on Mars are due to windblown dust (see Mars, changes on) and that the orange color of Titan's atmosphere is caused by organic aerosols. Sagan worked as a consultant and adviser to NASA for almost four decades, beginning in the 1950s, and played a prominent role in the Mariner 9, Viking, Voyager, and Galileo missions to the planets. He was a devotee and an advocate of broad international cooperation in space exploration and one of the founders (in 1980) and president (until his death) of the Planetary Society. He expressed the opinion that carrying life from Earth to other planets is a duty of mankind, and that the conquest and colonization by mankind of other planets and extraterrestrial space are essential to our survival. "All civilizations," he wrote, "become either spacefaring or extinct." His novel Contact (1985) was made into a successful film.